Gem Mining in North Carolina is an ages old tradition that started with the first Europeans to make their homes in the Blue Ridge Mountains of North Carolina. These early settlers quickly realized that the mountains were the perfect place to find rocks and minerals of all kinds. The ancient Appalachian mountains produce a variety of valuable materials, including emeralds, rubies, sapphires, and even gold. In addition to the stones that occur naturally in our area, we import gemstones from gem mines in places like Brazil, Indonesia, Pakistan, Australia, and Mexico. When Rough Gem Stones are first discovered, they don't look much like the shimmering specimens we're accustomed to seeing incorporated into Custom Fine Jewelry. In fact, some are barely distinguishable from their less valuable counterparts. However, we are Custom Jewelry Designers who have the skills necessary to transform these Rough Gem Stones into Unique Gemstone Jewelry. Our finished cut stones are some of the most luminous you'll every lay eyes on and we use our finely honed skills to create some of the most breathtaking Artisan Gemstone Jewelry on the market. Our finished cut stones are the perfect addition to Sterling Silver Gemstone Jewelry, and the Faceting Shapes we create with our Faceting Wheel take our Designer Gemstone Jewelry to the next level. 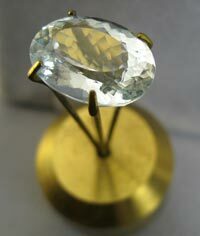 The Unique Gem Stone Jewelry we produce at our Custom Jewelry Manufacturing store in Foscoe NC is created onsite by our talented Custom Jewelry Designers using our Lapidary Equipment and Faceting Supplies and we specialize in creating a variety of different Cuts for Gem Stones. Typical cuts include Oval, Round Brilliant, Pear, and Emerald Cut, and we also offer abstract and specialty shapes like marquis, Portuguese, trillion, and heart shapes for additional fees. There is nothing quite as beautiful as the way a finished cut stone catches the light. Our Grinding and Faceting Machines allow us to produce some of the most exquisite Semi Precious Gem Stones and Custom Gem Stone Jewelry on the market, and our artistry and attention to detail ensure not only that each piece of Affordable Gemstone Jewelry is of the highest quality, but also that each piece is pleasing to the eye. Whether you're looking for Gemstone Silver Jewelry or Designer Inspired Gem Stone Jewelry, Facets of Foscoe has something for you. Much of our Custom Jewelry Gemstones has been handcrafted using North Carolina Gemstones that were found right here in the mountains of North Carolina. We sell a Mixed Assortment of Gem Stones and invite you to browse our site to find out more about the Custom Design Jewelry we offer, give us a call, or stop by our shop anytime!